To understand arterial stenosis, it is helpful to know how blood circulates to the brain (see Anatomy of the Brain). Blood is pumped from the heart and carried to the brain by two paired arteries, the internal carotid arteries and the vertebral arteries (Fig. 1). The internal carotid arteries supply the anterior (front) areas and the vertebral arteries supply the posterior (back) areas of the brain. After passing through the skull, the right and left vertebral arteries join together to form a single basilar artery. The basilar artery and the internal carotid arteries communicate with each other in a ring at the base of the brain called the Circle of Willis. The arteries most likely to be affected by stenosis are the internal carotid artery (ICA), the middle cerebral artery (MCA), the vertebral arteries, and the basilar artery. Figure 1. Intracranial stenosis is the narrowing of an artery inside the brain due to buildup of plaque inside the artery. The arteries most likely to be affected by stenosis are the internal carotid artery, the middle cerebral artery, the vertebral arteries, and the basilar artery. What is intracranial artery stenosis? Plaque can grow larger and larger, severely narrowing the artery and reducing blood flow to the brain. Plaque can eventually completely block (occlude) the artery. Plaque can roughen and deform the artery wall, causing blood clots to form and blocking blood flow to the brain. Plaque can rupture and break away, traveling downstream to lodge in a smaller artery and blocking blood flow to the brain. T: for time. If you or a loved one develops these symptoms, it is time to call 911 immediately. Symptoms of a TIA and stroke are similar. TIAs result when blood flow to the brain is temporarily interrupted and then restored. The symptoms typically last a couple of minutes and then resolve completely, and the person returns to normal. However, TIAs should not be ignored; they are a warning that an ischemic stroke and permanent brain injury may be looming. If you or a loved one develops these symptoms, you should call 911 immediately. Atherosclerosis is a major cause of intracranial artery stenosis. It can begin in early adulthood, but symptoms may not appear for several decades. Some people have rapidly progressing atherosclerosis during their thirties, others during their fifties or sixties. Atherosclerosis begins with damage to the inner wall of the artery caused by high blood pressure, diabetes, smoking, and elevated “bad” cholesterol. Other risk factors include obesity, heart disease, family history, and advanced age. Intracranial stenosis is associated with several conditions, including moyamoya disease, radiation-induced vessel damage (vasculopathy), high blood pressure, high cholesterol, and diabetes. Intracranial stenosis is responsible for 8 to 10% of strokes in the United States and affects certain ethnic groups more than others. These groups include African Americans, Asian Americans, and Hispanics. Patients with intracranial artery disease tend to be younger than those with carotid artery disease in the neck. Computed Tomography Angiography, or CT angiogram, is a noninvasive X-ray that provides detailed images of anatomical structures within the brain. It involves injecting a contrast agent into the blood stream so that arteries of the brain can be seen. This type of test provides the best pictures of both blood vessels (through angiography) and soft tissues (through CT). It enables doctors to see the narrowed artery and to determine how much it has narrowed. Magnetic Resonance Angiography (MRA) is similar to the CT angiogram. Contrast dye is injected through an IV to illuminate blood vessels in the neck. Angiogram is a minimally invasive test that uses X-rays and a contrast agent injected into the arteries through a catheter in the groin. It enables doctors to visualize all arteries and veins in the brain. It carries a low risk of permanent neurologic complications. Beyond identifying the area of disease, angiography provides valuable information about the degree of stenosis and shape of the plaque (Fig 2). Figure 2. 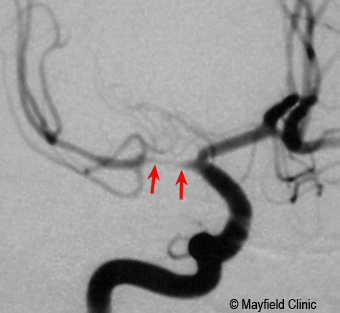 Angiogram shows a narrowing of the middle cerebral artery (red arrows) caused by atherosclerotic plaque. Transcranial Doppler Ultrasound is a quick, inexpensive test used to measure the velocity of blood flow through blood vessels in the brain. Technicians measure blood flow velocity by emitting a high-pitched sound wave from an ultrasound probe. Different speeds of blood flow appear in different colors on a computer screen. The more sluggish the blood flow, the greater the risk of stroke. Computed Tomography (CT) Perfusion imaging is a noninvasive test that detects blood flow in the brain and is used in planning surgery. It involves injecting a contrast agent into the bloodstream so that doctors 1) can study how much blood flow is reaching the brain and 2) can determine which areas of the brain are most at risk of stroke. During the test a medication called Diamox (acetazolamide) is given to dilate the arteries. This medication is a type of "stress test" for the brain and is similar to a stress test used for the heart. Positron Emission Tomography (PET) allows the doctor to study the brain’s function by observing how glucose (sugar) is metabolized in the brain. A small amount of radioactive glucose is injected into the bloodstream. The PET scanner takes pictures of the brain that are interpreted by a computer. The results may help doctors locate abnormalities. The goal of treatment is to reduce the risk of stroke. Treatment options for intracranial stenosis vary according to the severity of the narrowing and whether you are experiencing stroke-like symptoms or not. Patients are first treated with medication and are encouraged to make lifestyle changes to reduce their risk of stroke. Surgery is limited to patients whose symptoms do not respond to medication. Intracranial stenosis can be treated with medications that minimize risk factors, including high cholesterol and blood pressure. If you smoke, you may be prescribed medications that help you quit. Patients with diabetes will be advised to maintain tight control of their blood sugar through a healthful diet and careful monitoring. Blood thinner medications, also called anticoagulants (aspirin, Plavix, Coumadin), allow the blood to pass through the narrowed arteries more easily and prevent clotting. Studies show that aspirin and Coumadin provide similar benefits. Because blood-thinners are associated with an increased risk of bleeding, patients may be monitored for abnormal bleeding. Aspirin has fewer side effects than Coumadin and is associated with a lower risk of bleeding or hemorrhage . Patients taking Coumadin must have their blood monitored periodically; patients taking aspirin and/or Plavix do not require monitoring. Cholesterol-lowering medications help reduce additional plaque formation in atherosclerosis. These medications can reduce LDL (low-density lipoprotein) cholesterol by an average of 25 to 30% when combined with a low-fat, low-cholesterol diet. Blood pressure medications (diuretics, ACE inhibitors, angiotensin blockers, beta blockers, calcium channel blockers, etc.) help control and regulate blood pressure. Because high blood pressure is a major risk factor of stroke, regular blood pressure screenings are recommended, along with taking your medication regularly. The aim of surgery is to prevent stroke by removing or reducing the plaque buildup and enlarging the artery to allow more blood flow to the brain. Surgical treatment is considered for patients whose symptoms do not respond to medication. For example, those who continue to have TIAs or strokes, those with a high grade of stenosis, and those with insufficient blood supply to an area of the brain. Balloon angioplasty / stenting is a minimally invasive endovascular procedure that compresses the plaque and widens the diameter of the artery (Fig. 3). Endovascular means that the procedure is performed inside the artery, from within the bloodstream, with a small flexible catheter. The catheter is inserted into the femoral artery in the groin during an angiogram. The catheter is then advanced through the bloodstream to where the plaque-narrowed artery is located. A small balloon is then slowly inflated within the narrowed artery to dilate it and compress the plaque against the artery wall. Figure 3. During angioplasty a balloon-tipped catheter is placed within the narrowed vessel. The balloon is inflated compressing the plaque and opening the artery. 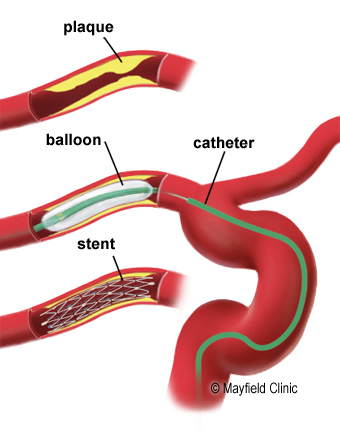 After the balloon is removed, a self-expanding mesh-like tube called a stent is placed over the plaque to hold open the artery. The stent remains in the artery permanently. The aim is to reduce stenosis by less than 50%, as a small increase of the vessel diameter results in large increases in blood flow to the brain. The balloon is then deflated and removed. In some cases, a self-expanding mesh-like tube called a stent is placed over the plaque, holding open the artery. Complications from angioplasty can include stroke, tearing of the vessel wall from the catheter or balloon, and vasospasm. Angioplasty is typically recommended for patients who have high-grade artery stenosis (greater than 70%) and recurrent TIA or stroke symptoms despite medication treatment . Angioplasty / stenting can successful reduce the stenosis to less than 30% without complications in 60 to 80% of patients . Cerebral artery bypass is a surgical procedure that reroutes the blood supply around the plaque-blocked area. This procedure requires making an opening in the skull, called a craniotomy. A donor artery from the scalp is detached from its normal position on one end, redirected to the inside of the skull, and connected to an artery on the surface of the brain. The scalp artery now supplies blood to the brain and bypasses the blocked vessel (see Cerebral Bypass Surgery). Complications from bypass can include stroke, vasospasm, and clotting in the donor vessel. Bypass is typically recommended when the artery is 100% blocked and angioplasty is not possible. Results of artery bypass vary widely depending on the location and type of bypass. Ask your surgeon what results you can expect. Despite treatment with medications, patients who have had a stroke or TIA due to intracranial artery stenosis face a 12 to 14% risk of recurrent stroke during the 2-year period after the initial stroke. In some high-risk groups, the annual risk of recurrent stroke may exceed 20% . After angioplasty, restenosis can occur in 7.5 to 32.4% of patients and is usually not symptomatic. The long-term outcome of stroke prevention after angioplasty is not yet known, but short-term results are promising and is currently being studied in clinical trials. It’s important to understand that atherosclerosis is a progressive disease. To prevent a stroke, your physician may ask you to stop smoking, limit heavy alcohol consumption, maintain good blood-sugar control (if you have diabetes), lower your cholesterol, and take medications as prescribed. Qureshi AI, et al. Consensus conference on intracranial atherosclerotic disease: rationale, methodology, and results. J Neuroimaging 19 Suppl 1:1S-10S, 2009.
transient ischemic attack (TIA): a “mini” stroke caused when blood flow to the brain is temporarily interrupted and then restored; causes no permanent brain damage. vasospasm: abnormal narrowing or constriction of arteries due to irritation of the vessel wall or by blood in the subarachnoid space. Mayfield Brain & Spine treats more than 200 people with intracranial artery stenosis each year. 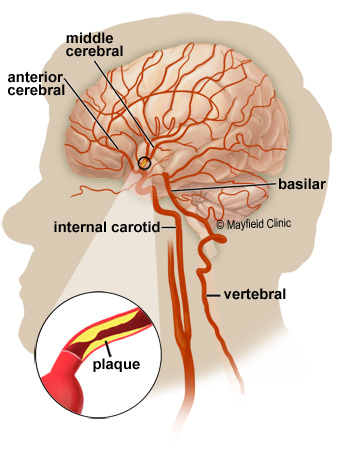 Rapid treatment of plaque buildup (atherosclerosis) in the arteries of the brain can greatly reduce the risk of stroke. Our neurosurgeons and endovascular surgeons perform balloon angioplasty / stenting, and cerebral artery bypass.